Collaborators’ Q&A: What inspires you in this poem? What drew you to it? Artist Giang Pham: The subject is very relevant to the push and pull of our current social structures, where many are still standing up for their humanity and others have yet to grasp the harm of their beliefs. 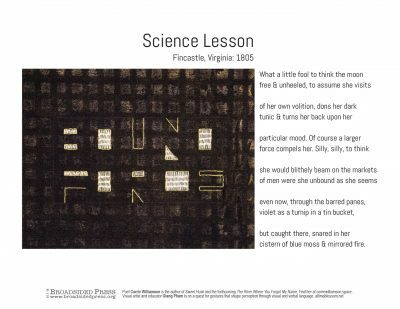 Did the visual artist refract any element of the poem that made you see the poem differently? Poet Corrie Williamson: [It] is an interesting contrast to the poem’s moody moon images, which to me suggest roundness and femininity. I like that the image brings out the rigidity of rule and measure, and reinforces the poem’s suggestion that the speaker is trapped or enclosed by laws or standards she cannot alter.